George William Haigh was born in Ossett in 1895. the only surviving son of George Haigh and his wife, Jane (nee Wilby) who married in 1874. The couple had five children, born between 1875 and 1895, but one child, Henry was born in late 1900 then sadly died early the following year. In 1911, George Haigh, a rag grinder, wife Jane and their four children, all aged between 16 and 36 years, were living in a three-roomed home at 13, Happy Land, Ossett. Their three girls were working as rag sorters and George William was a rag grinder for a mungo manufacturer. George William Haigh’s army service record has not survived, but it is known that he enlisted at Ossett, and that he embarked for France on the 13th April 1915. "News has been received this week of two further casualties among 1st/4th K.O.Y.L.I. The first victim, Private George William Haigh, was killed by a sniper's bullet. Private Haigh was the only son of Mr. George Haigh of 13, Happy land, Ossett, himself a volunteer of 28 years standing. He was 21 years of age last July, and was a conductor on the Ossett and Wakefield tramway before the war. He had been two years in the Territorials, and went to the Front with the battalion in April. On Monday Mr. Haigh received a postcard from his son dated December 2nd, saying he was quite well and would write a letter in a day or two. But on Wednesday morning there came the following letter, written by Lieut. and Quartermaster H.G. Stickley, on behalf of the Commanding Officer: "Dear Sir - It is with extreme regret that I write to inform you of the death of your son Private G.W. Haigh, of the battalion under my command. He was killed in action yesterday (December 3rd) by a German sniper's bullet. Every possible assistance was rendered to him, but he was absolutely beyond all human aid. He died shortly afterwards and suffered no pain. I hope you will accept my heartfelt sympathy in your sad bereavement, which must come as a great shock to you. But there is, however, some little consolation in the knowledge of the fact that your son bravely died for a great and noble cause, in defence of the flag and country he loved so dearly. He is buried just behind the trenches and his grave is marked with a cross, and I can assure you that it will receive every care and attention from his comrades out here. I cannot at present tell where he is buried, but I hope at some future date to tell you the exact spot where his body lies." Mrs. Haslegrave, wife of Lieut-Col Haslegrave, who commands the battalion has also sent Mr. Haigh a letter of sympathy. Private Haigh as a violin player, was a member of the orchestra connected with the Temperance Hall and Green Congregational Church." 2.12.1915: Very quiet night. Enemy machine guns and snipers rather active. 3.12.1915: Very quiet night. Enemy sent a number of heavy shells behind our lines and also shelled Skipton Road. We know that Private Haigh was killed by a German sniper on the 3rd of December 1915, although his death is not listed in the Battalion War Diary. 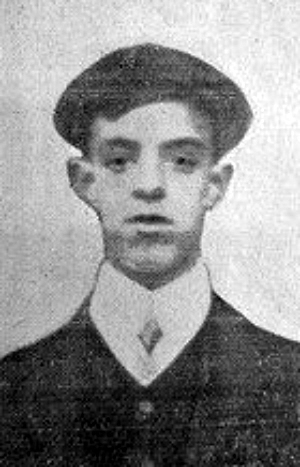 Another Ossett soldier, Private Harvey Grace, also in the 1st/4th Battalion of KOYLI also died from wounds on the 4th December 1915 when located in the same trenches as Private George Haigh. 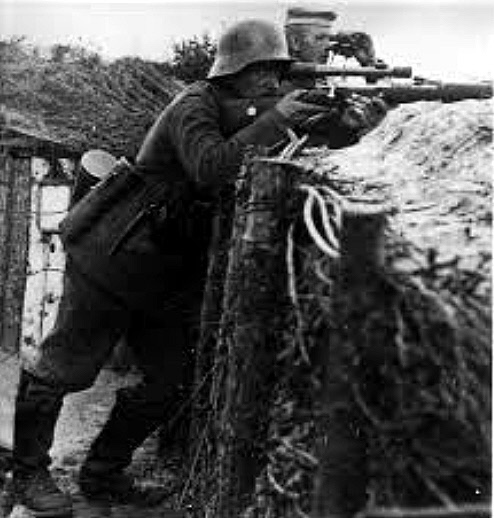 Did the same German sniper kill both Ossett men? George William Haigh was posthumously awarded the British and Victory medals and, to recognise his overseas service before 31st December 1915, the 1914/15 Star. Private George William Haigh was killed in action on the 2nd December 1915, aged 21 years, the son of George and Jane Haigh of 13 Happy Land, Ossett and is buried at grave reference I.A.32. at Bard Cottage Cemetery,2 Ieper, West-Vlaanderen, Belgium. The Cemetery is located on the Diksmuidseweg road (N369) in the direction of Boezinge. For much of the First World war, the village of Boesinghe (now Boezinge) directly faced the German line across the Yser canal. Bard Cottage was a house a little set back from the line, close to a bridge called Bard's Causeway, and the cemetery was made nearby in a sheltered position under a high bank. Burials were made between June 1915 and October 1918 and they reflect the presence of the 49th (West Riding), the 38th (Welsh) and other infantry divisions in the northern sectors of the Ypres Salient, as well as the advance of artillery to the area in the autumn of 1917. After the Armistice, 46 graves were brought in to Plot VI, Row C, from the immediate area, including 32 from Marengo Farm Cemetery (this was located a few hundred metres to the south of Bard Cottage, on the same side of the road. It was used from June 1915 to August 1916). There are now 1,639 Commonwealth casualties of the First World War buried or commemorated in this cemetery. 39 of the burials are unidentified but special memorials commemorate three casualties known to be buried among them.